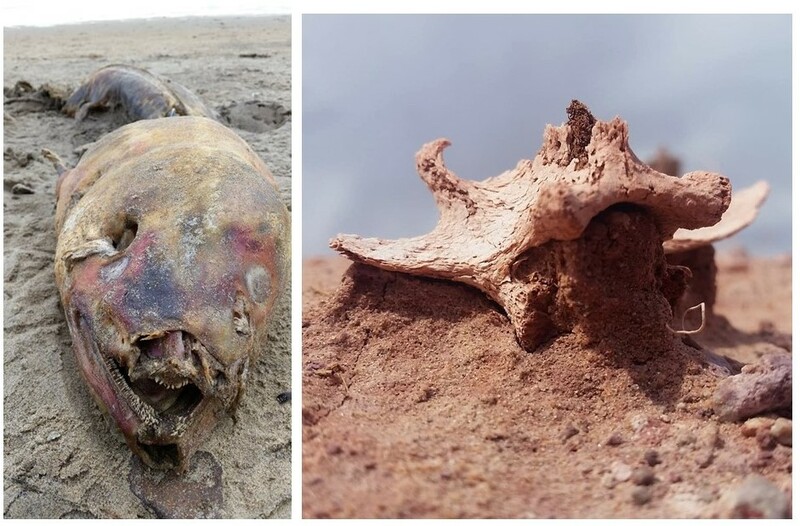 The field of taphonomy involves the processes acting on the building blocks of life following death, and provides an ever evolving insight into fossilization. While the popular concept is that fossils are the remains of biomineralized hard tissues, a huge body of research is now devoted to interpreting evidence of preserved soft tissues. This rich resource survives is in spite of the fact that experiments show that soft tissues are generally prone to decay and, in most cases, completely disappear within weeks to months postmortem. Left: A decaying moray (Isle of Wight, UK). While all the hard tissues are still in place (see teeth), decay is already advanced, and will most likely result in a complete loss of soft tissues. Photo credit: Jasmina Wiemann. Right: A vertebra of a recently skeletonized mammal (probably a pronghorn, Petrified Forest National Park, US). All soft tissues appear to have disappeared. Photo credit: Jasmina Wiemann. In very rare cases of exceptional preservation, often facilitated by replication in minerals, evidence of soft tissues survives in rocks over hundreds of millions of years old. In contrast, reports of original organic matter in dinosaur bones, including proteins that are still responsive to immunological reactions, have proved controversial. Such preservation seems unlikely given the susceptibility of proteinaceous structures to hydrolysis which cleaves peptide bonds within geologically short time spans. My curiosity started when brittle, but still pliable, brown-stained residues emerged when I decalcified fossil shell fragments. No chemical mechanism was known that could resolve this paradox prompting me to focus my research on these soft tissue structures – organic residues preserved in vertebrate hard parts. In a collaboration with a team of paleontologists, Derek Briggs and Matteo Fabbri (Yale University), Mark Norell (American Museum of Natural History), Martin Sander and Tzu-Ruei Yang (University of Bonn) and Koen Stein (University of Brussels), I decalcified microscopic aliquots of thirty hard tissue samples covering teeth, enamel scales, bones and eggshells from all over the world, ranging in age from Late Triassic (200 million years ago) to modern. Sediment samples and a variety of other controls, such as glues and resins commonly used in the conservation of vertebrate fossils, were subjected to the same analytical routine. 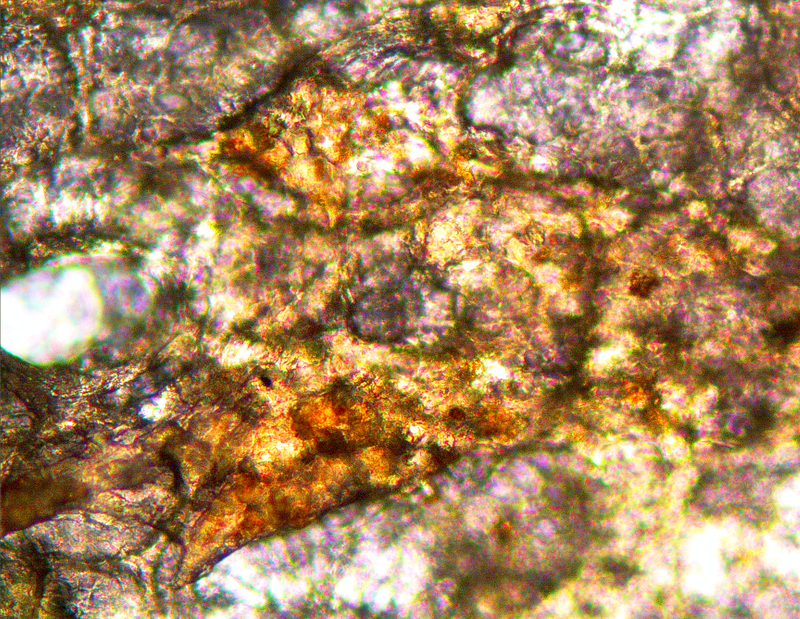 Microphotograph: Bone cells, blood vessel fragments, and bone matrix extracted from the ulna of a diplodocid dinosaur (about 150 million years old, Howe Stephen’s Quarry, US) – the first sample decalcified for this project. We found that soft tissues, such as cells, blood vessel fragments, nerve tubules, and fragments of extracellular matrix were more likely to be preserved in samples from oxidative environments (hematite-rich sandstones, shallow marine limestones). The pore water conditions associated with bones and other hard tissues in such environments are generally alkaline. These conditions allow the transformation of protein- and lipid-rich tissues, catalyzed by phosphate and transition metal ions, to N-heterocyclic polymers called advanced glycoxidation and lipoxidation end products, which are resistant to hydrolysis. In changes following death and burial pore waters enriched in ions taken up from the surrounding sediment are drawn into vascular canals and cellular networks through capillaries. Bone minerals are dissolved until a dynamic equilibrium with the pore water is reached, and alkaline, oxidative conditions arise. Surface reactions between pore waters and adjacent biomolecules transform proteins and lipids into more stable N-heterocyclic polymers. Glycoxidation and lipoxidation, which are well known reactions in food chemistry, transform proteins and lipids to progressively non-proteinaceous N-heterocyclic polymers. We replicated this alteration in the laboratory by heating soft tissues from eggshells in thermal maturation experiments. Microphotograph: Experimental maturation of material extracted from eggshell initiates glycoxidation/lipoxidation: local browning reflects the formation N-heterocyclic polymers. The significant similarity between the experimentally matured samples and the fossil material suggests that they are the result of the same chemical alterations: fossilization transforms proteins and lipids into water-insoluble, microbially resistant, stable N-rich polymers of advanced glycoxidation/lipoxidation end product type (AGEs and ALEs) during early diagenesis. These protein fossilization products were present only within vertebrate hard tissues and not in the associated sediments, or control samples. Interestingly, a spatial analysis of the distribution of peptides and their fossilization products, N-heterocyclic polymers, suggests that a few original peptide bonds may still be intact within the transformed soft tissue extracted from a fossil bone (Allosaurus fragilis). Molecular maps: A soft tissue sample from a dinosaur (Allosaurus fragilis) vertebra. The scale bar equals 300 microns. The saturation of the red color indicates the signal strength of the compounds mapped using Raman spectroscopy. The spatial distribution of N-heterocyclic polymers (b) corresponds well the AGE/ALE marker pentosidine (c), while amide signals are more abundant in areas with weak or absent N-heterocycle signals (d). Considering that amides are the key feature of peptide bonds (labeled in g), and that oxidative crosslinking would, at an advanced stage, consume peptide bonds and their adjacent amino acid residues, it appears that a few peptide bonds may have survived the crosslinking process in this sample. Determining whether this signal reflects unaltered, original peptide moieties, or diagenetic non-proteinaceous amides, will require more research. Protein and lipid fossilization products are capable of retaining their original morphology, whether a cell membrane, blood vessel wall, or extracellular matrix fibers. N-rich heterocycles are characterized by brownish stains, which not only tint the transformed fossil soft tissues, but also contribute to the color of the bone or eggshell that contains them. Identifying the settings where soft tissues are preserved, namely fluvial and alluvial sandstones, dune sands, and shallow marine limestones, provides a target for future discoveries of vertebrate remains that are likely to preserve soft tissues. The evidence they provide can be used to address a variety of evolutionary, biomechanical, and ecological questions. Fossils are not just ‘rocks’: in suitable environments they often preserve original, but chemically transformed soft tissues which our research validates as a signficant, yet largely unexplored resource of biological information.